Years of full coverage of the worlds best Halloween Parade! Toms River NJ has become the Halloween Capitol of the Universe! Thousands of Participants & Floats! Please refer to Toms River Township website for Trick or Treat information. 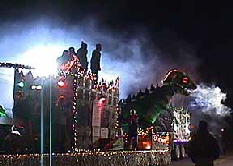 Toms River Halloween Parade is the 2nd largest in the world according to Guinness Book of World Records!